This project took both of us (Karen & Cam) several months to complete. It was a once-in-a-lifetime commission, as our client, Mary, was wonderful to work with. She very much understood what she wanted in her completed dresser and cheerfully worked hard with us to bring her vision to life. The completed project has 6 drawers for clothing and 5 velvet-lined ones for jewelry, the centre top one with a secret hidden lock. All of the drawer slides are full-extension all wood slides which Karen has perfected after writing an article about them for Fine Woodworking Magazine in issue # 117 (March-April 1996) over twenty years ago. The wood is wavy Western Maple we acquired from our friends Persjis, Emilia and Barb Erglis at Clearwater Wood Industries in Victoria. 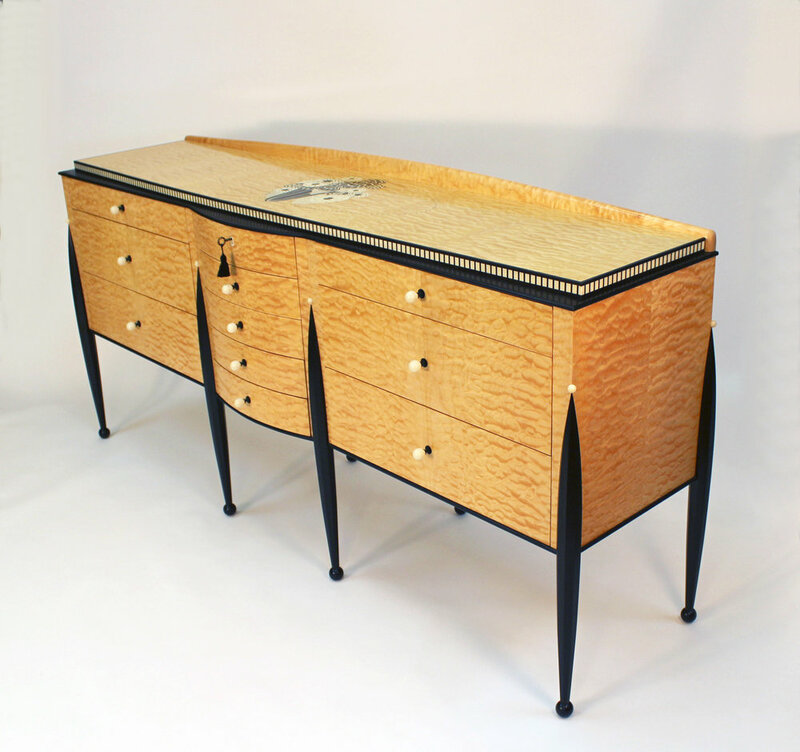 Karen completed the black and white marquetry in the style of Art Deco master, J.E.Ruhlmann using black-dyed Swiss Pear and Bleached white Mahogany. The spherical handle pulls and decorative spheres are made of “vegetable ivory” tagua nuts from Equador. From start to finish the custom dresser project was a joy. At our first meeting, Cam and Karen won my confidence as clearly accomplished, knowledgeable and professional. From there we moved into concept drawings and research, where they showed enormous appreciation for both the artistic side as well as the challenges of execution. Many a sample was done to hone the effect, offering very slight differences to suit my taste. There was creative craftsmanship by Karen to handcraft a secret lock, create full-extension, all wood drawer slides and execute the very fine marquetry/inlay for the piece de resistance top surface, to mention a few. Cam was both artist and fine furniture maker, from the rendering of the surface art, to managing the dimensions of curves, quality of material, assembly, veneering …too much to capture! The fine finish was a testament to pursuit of excellence. When the piece was installed, Cam sent a polishing rag scooting the length of the piece. Both team members listened carefully to my criteria, pondering all possible adjustments to the plan without compromise to quality. Both Cam and Karen are excellent communicators, with weekly updates, and quick resolution over any points needing clarity. Billing, project progress and communications were orderly. Coventry Woodworks are well worth their rate, I gladly recommend them.